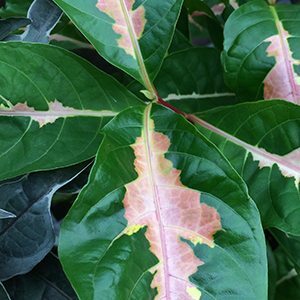 A colourful foliage plant that grows well in tropical to sub tropical areas, Graptophyllum pictum is sometimes called the Caricature Plant, also known as the Jamacian Croton. A number of colourful cultivars are available and they will grow as far south as Sydney, however they will need a warm protected position. Although seen as an evergreen plant, in cooler climates it can be deciduous. This is plant that requires protection from frosts and cold winds. Use some of the many colourful varieties available at nurseries for underplanting taller shrubs and trees in a tropical designed garden. You can also grow them in containers in a shaded sheltered courtyard where the good foliage colour gives the area a lift. Prepare the soil well before planting. Dig in some well rotted compost and aged cow manure. Easily propagated from stem cuttings taken in early spring. 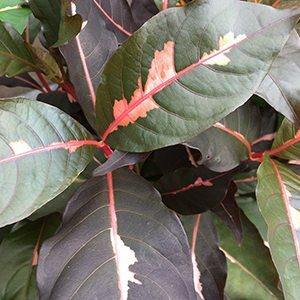 Foliage – Varied from red, green and variegated forms are available. Flowers – Flowers are insignificant, mainly grown for the foliage. Position – Best in dappled shade.